As the LED display has many advantages, like high brightness, long life, strong light penetration, clearly visible under strong light, it is widely used in many areas, such as the sea ports, building, traffic information display. The company used the LED display in a driving control prompt system of a large port engineering locomotive. The console of the entire system is the Siemens 300 PLC, the customer needs to achieve the data transmission between console PLC and LED screen. LED support RS485 serial communication. The display shows the content information sent by the console in order to remind the scene of the locomotive driving direction and the staff attention to safety. In a variety of large ports and terminals, engineering locomotives and cranes need to load and unload cargo and containers, because the site environment is more complex, system center needs unified schedule. In the master control room, using Siemens 300PLC and SSTCOMM GT100-DP-RS gateway, which send instructions to the LED display and show the received instructions. According to the instructions displayed on the LED that sent by the master control room, engineering vehicles and cranes load and unload cargos with direction and remind the site staff pay attention to safety and release notice, greatly improving the efficiency of the port and the terminal. 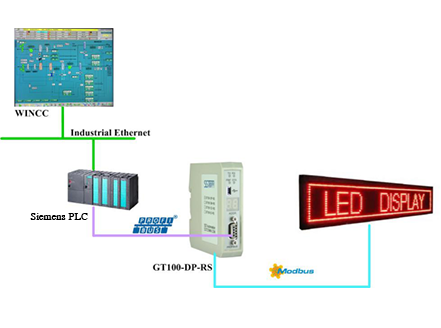 In this control system, SST Automation Gateway GT100-DP-RS woks as a bridge between LED display screen and Siemens PLC S7-300, which enable fieldbus equipment of two different protocols achieve data communication, make it possible that PLC console can send data to the LED. In the whole system, the Gateway GT100-DP-RS of SST Automation demonstrates its stability, reliable capability, provides a good guarantee for the entire control system can run well.